Uh. So who authorizes them, because this is from a Dell SUU DVD, that’s about as good as I can get. Now, the other alternative should have been to mount the SUU ISO as Virtual Media ISO and boot from it. But for whatever reason, this isn’t working and after selecting it, it just boots the HDD. I’m assuming, this is because the firmware on the iDRAC/LCC is too old and having some issues booting the ISO. That’s fine. I didn’t troubleshoot it too much after it failed 3 times in a row. I dislike hardware reboots that take 10 minutes, which is why I like VM’s, so I went looking for an alternative solution, and was happy with it. 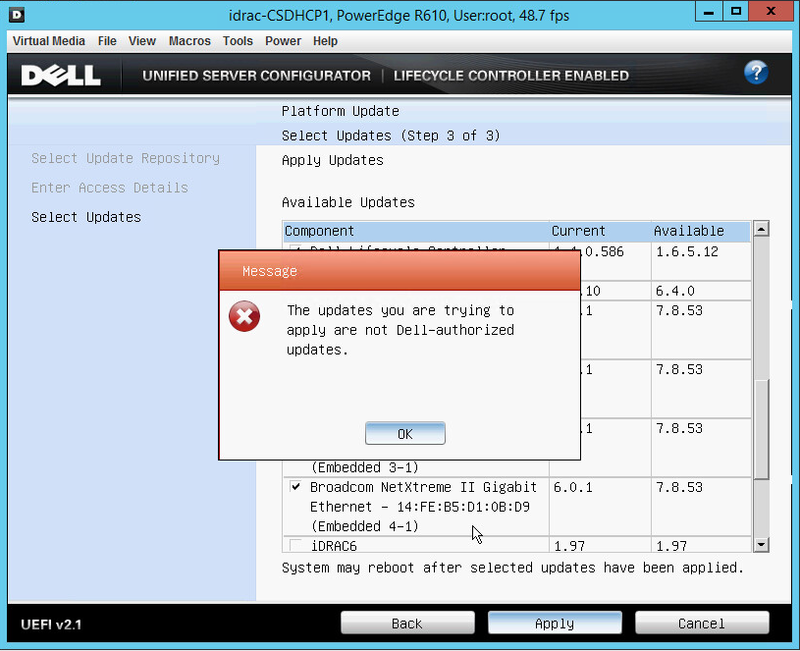 Right now, you only need to do the Dell Lifecycle Controller. You could of course do more, but the point for me is to get the LCC working, then move back to doing the updates via that interface. So we’ll ONLY do the one update from here. Click UPDATE NOW in the upper left corner. You can see the STATUS DESCRIPTION showing it is being updated. As you know, I both work for a Dell shop and have some Dell servers at home. 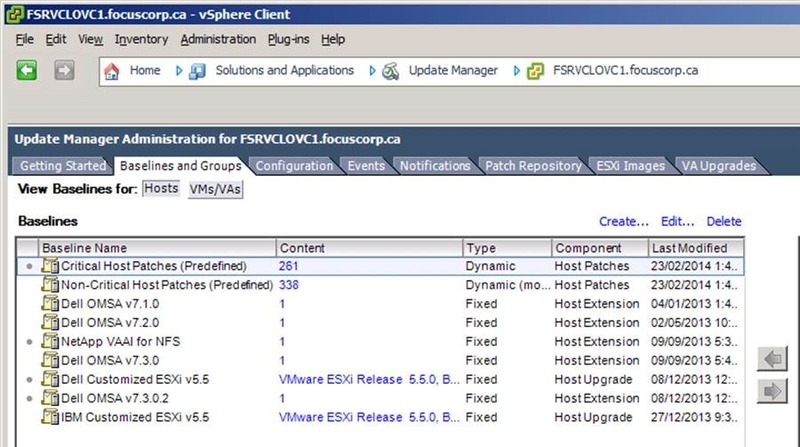 Also, VMware recently release vSphere v5.5.0 U1. As such, it’s a good time to go and check for vendor updates and support. 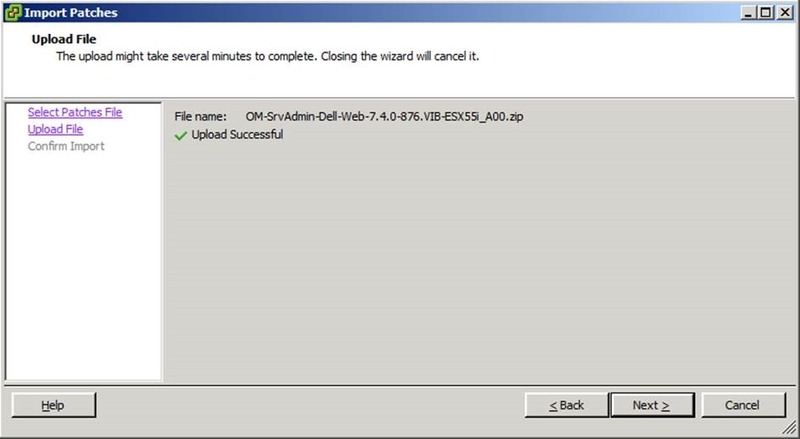 If you update to OMSA VIB v7.4, any SNMP monitoring you’re doing may require MIB updates. This is the Dell Customized ESXi v5.5 Build #1331820 ISO. Note that this is NOT v5.5.0 U1 at this time. Which might come in handy when troubleshooting. Good luck, and see you in another 3 months! Dell Open Manage System Administrator (OMSA) is the tool installed on ESXi to allow access to the system directly vs via the iDRAC. 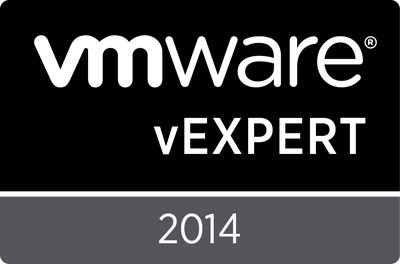 As ESXi is neither Linux or Windows, it requires VIB’s to install software created by certified partners of VMware. This will cover the process to get the new update installed and available to update hosts during the next maintenance window. 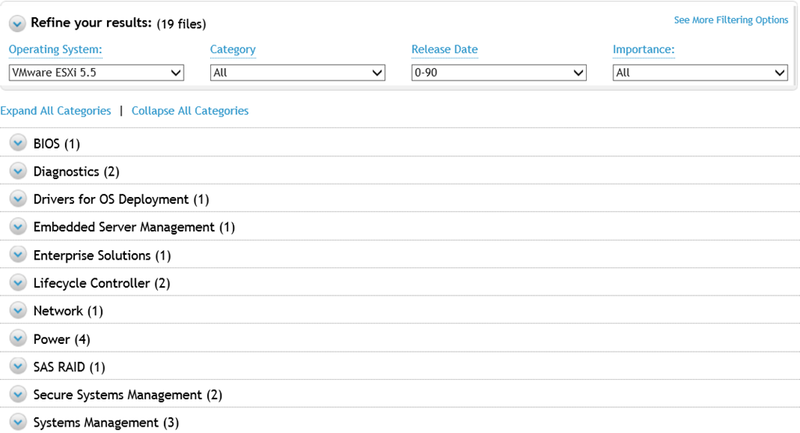 2) Open the vSphere Client and browse to HOME -> SOLUTIONS AND APPLICATIONS -> UPDATE MANAGER. 5) When the file is finished importing, click FINISH. You can see previous “Dell OMSA v7.x.x” baselines we’ve created. We’re going to create a new one for v7.4.0 so click CREATE. 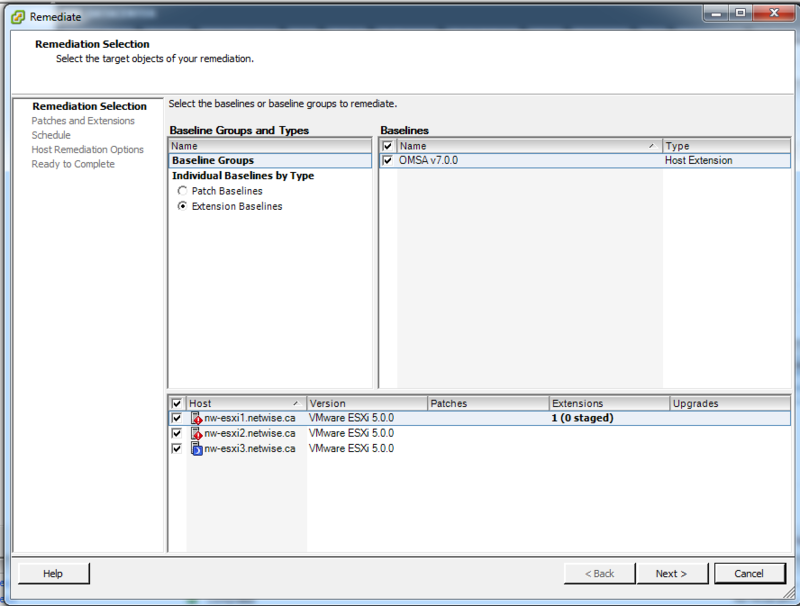 Select your option and click the DOWN ARROW to add it to the lower EXTENTIONS TO ADD window. Click NEXT. 11) Next, on the right hand side of the BASELINES AND GROUPS tab, expand your Baseline Group (you should always have created one – that would be another topic). 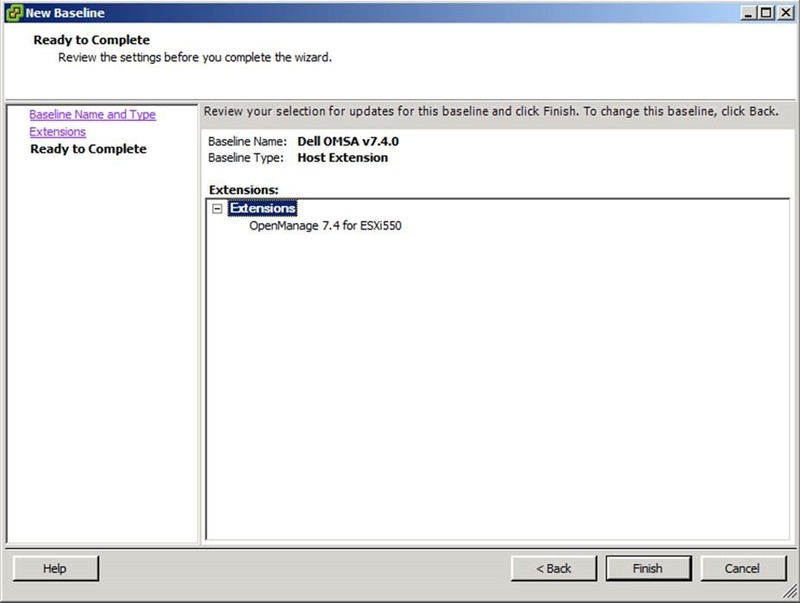 Note that if you select the pre-existing DELL OMSA v7.3.0.2 the <- arrow turns green so you can remove it. Do so. 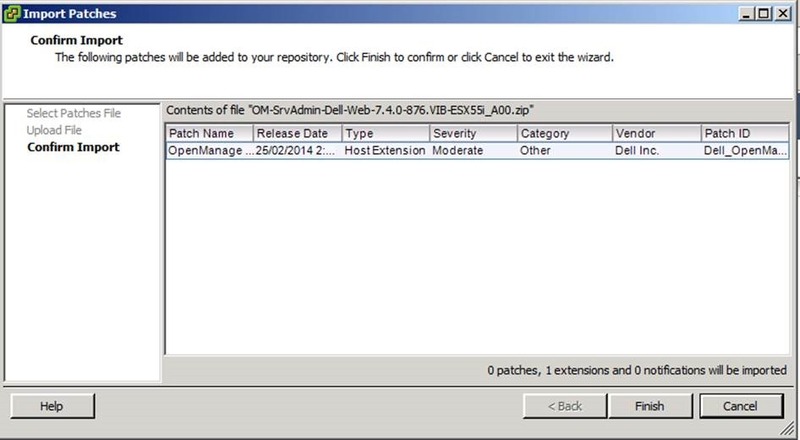 Then select DELL OMSA v7.4.0 and click the -> right arrow. 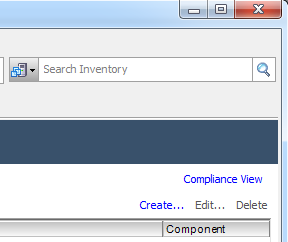 13) Click the COMPLIANCE VIEW link in the upper right hand corner. 14) Click SCAN in the upper right corner to scan your hosts for upgrades, patches, and extentions. 15) Check box boxes and click SCAN. At this point, the next time your have a maintenance window, you can simply click REMEDIATE and choose the BASELINE GROUP. If you have vSphere Patches, ESXi Upgrades (eg: v5.5.0b to v5.5.0 U1), or Extensions (eg: OMSA VIB’s), all 3 will happen automatically in sequence as or if required. 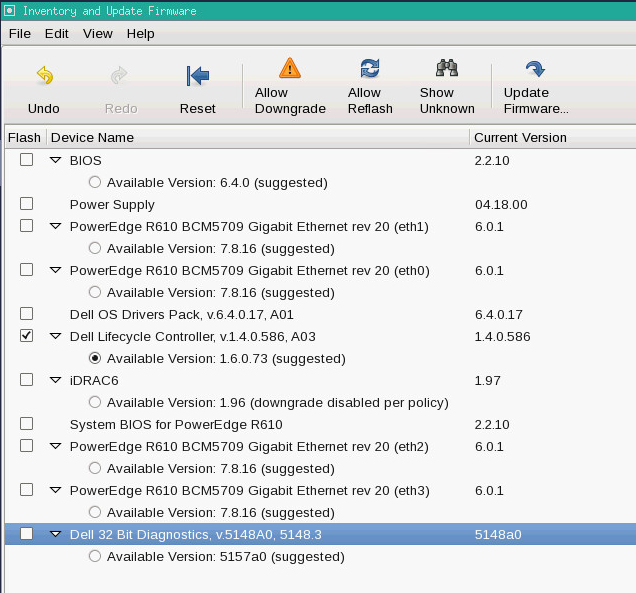 Dell OMSA v7.0 is out for ESXi v5.0U1! Fresh as of 4/18/2012. Required if you are using ESXi v5.0U1 and OME v1.x (which I now am). 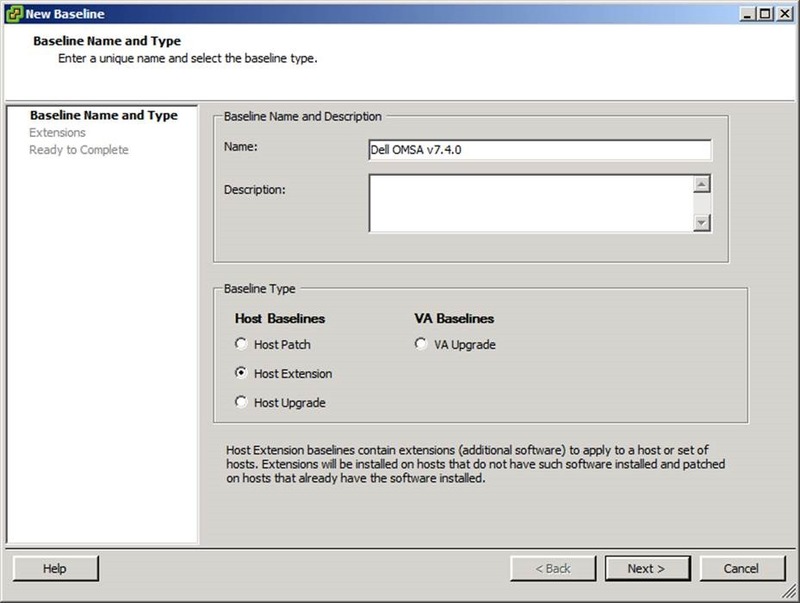 OMSA for ESXi without the console is installed as Host Extension via a VIB, provided by Dell. 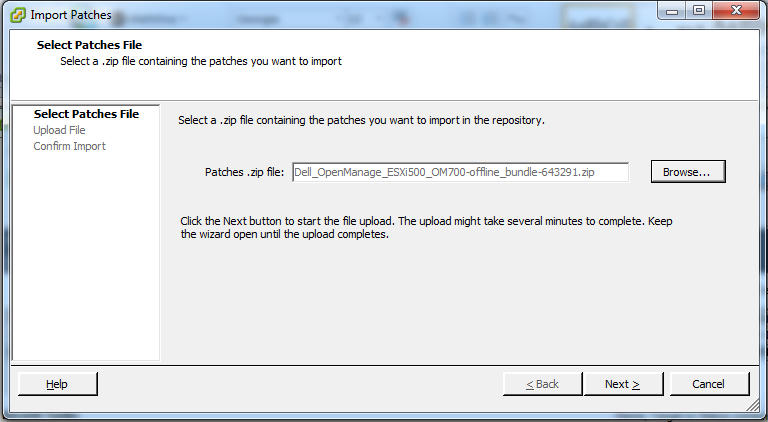 The above link will provide you a ZIP file – and the actual Host Extension is a zip file within that ZIP. 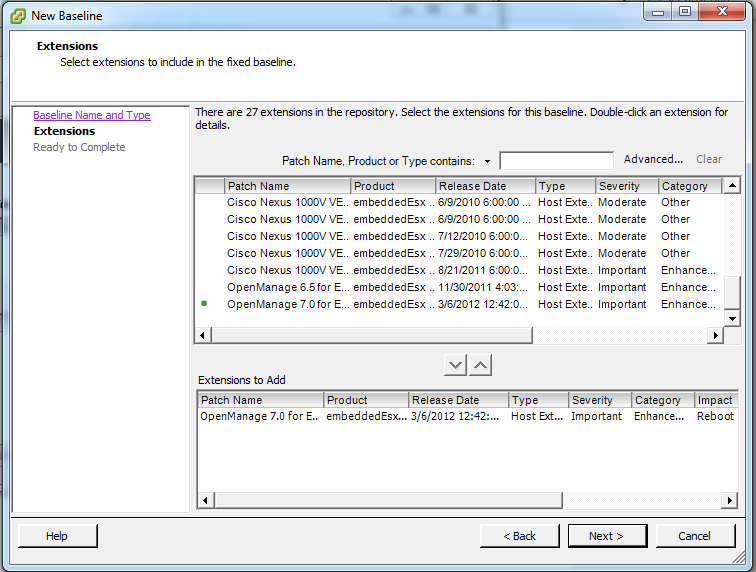 Name your Baseline – something like “OMSA v7.0.0” would be appropriate. 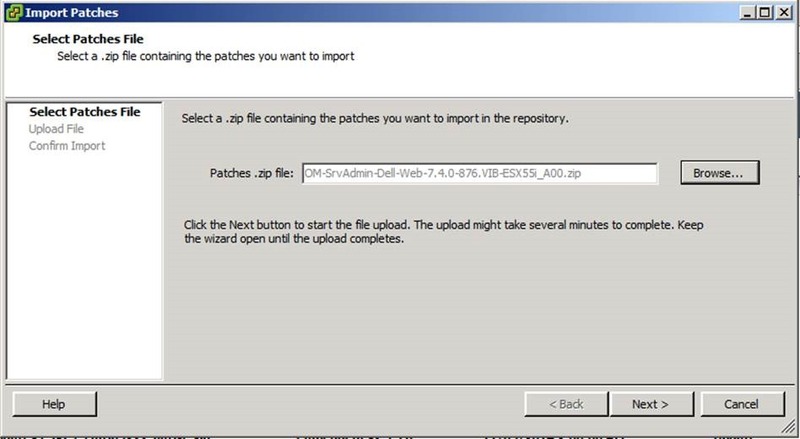 Ensure you select the radio box for “Host Extension” vs. the default of Host Patch. 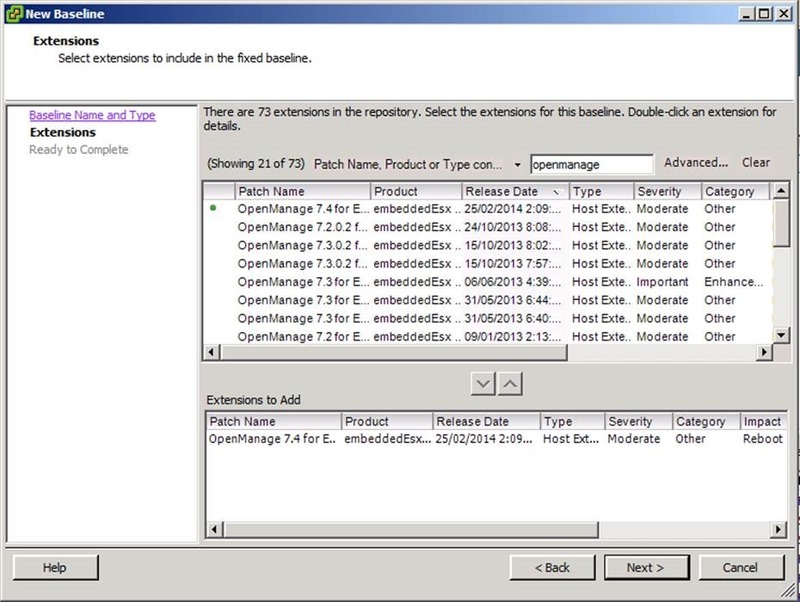 Select the OpenManage 7.0.0 for ESXi and use the down arrow to add it to the Extentions to Add window. 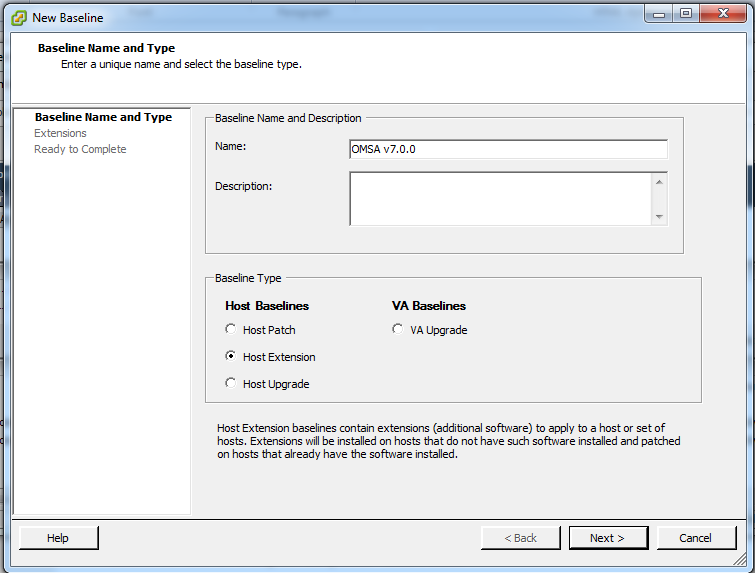 When you click Remediate, you’re going to want to select “Host Extension” vs “Patch Baseline” and select your newly created OMSA v7.0.0 Host Extension Baseline.